This PDF 1.7 document has been generated by Microsoft® Word 2016, and has been sent on pdf-archive.com on 23/11/2017 at 16:34, from IP address 122.180.x.x. The current document download page has been viewed 191 times. File size: 278 KB (15 pages). the world are trying to understand, define and ultimately integrate. field and are likely to be used in many other domains. ensuring safety of other users of airspace and persons on the ground. 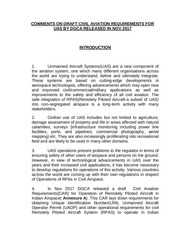 of Operations of RPAs in Civil Airspace. world. These have been discussed in succeeding paragraphs. specialists, surveillance and communications experts and others. for hobby and purely recreational purpose are called model aircraft. has agreed to be its guide and mentor as CHIEF PATRON. heavily travelled roadways, government facilities, etc. permitted only upon prior approval by the ATC. with and gives way to any manned aircraft. UAS for commercial Aerial mapping or land surveys. equipment or factory inspection, security or communications. The UAS must be under 55 Pounds of weight(25 kg). Airspace is allowed without the required ATC permission. either by the remote pilot in command or a visual observer. Must yield right of way to manned aircraft. moving platform unless in a sparsely populated area. more than one UAS at a time. Aviation Agency) website online. The Fee for registering is 5$. displayed on the UAS all the time. apply for a waiver stating how is he going to do this safely. The remote pilot must be of at least 16 Years of age. complete a free online course given in FAA website. security check of the pilot. operations without endangering the safety of national airspace. mentioned in it have been not achieved yet for RPA internationally. conditions mentioned for a Civil UAS operator. mean end of Make In India in the UAS field for the private players. from the pilot. So this requirement must be deleted. has the second largest pool of scientists and engineers in the world. aircraft. It needs in depth study of RT phraseology and passing a exam. compact and light enough to be placed in Nano, Micro, Mini RPA. now, though some prototype equipment is being tried out in this field. of FAA rules in USA have not mentioned the need for such a equipment. This file has been shared by a user of PDF Archive. Document ID: 00700705.